Prints bundles as a newline separated list of individual instructions Duplexes are separated by a vertical tab character A trailing line includes bundle properties such as endloop0/1. Definition at line 25 of file HexagonInstPrinter.h. Definition at line 27 of file HexagonInstPrinter.h. References getRegisterName(), MI, llvm::RISCVFenceField::O, printBrtarget(), printInst(), printInstruction(), printOperand(), and printRegName(). Definition at line 41 of file HexagonInstPrinter.h. Definition at line 42 of file HexagonInstPrinter.h. 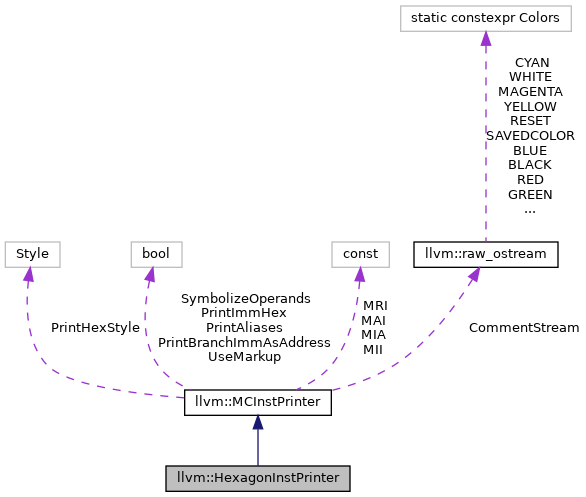 Referenced by HexagonInstPrinter(), llvm::HexagonAsmPrinter::PrintAsmOperand(), printOperand(), llvm::HexagonAsmPrinter::printOperand(), and printRegName(). Definition at line 81 of file HexagonInstPrinter.cpp. References assert(), llvm::format(), llvm::MCOperand::getExpr(), llvm::HexagonMCInstrInfo::getExtendableOp(), llvm::MCInst::getOperand(), llvm::HexagonMCInstrInfo::isConstExtended(), and llvm::MCOperand::isExpr(). Definition at line 34 of file HexagonInstPrinter.cpp. References assert(), llvm::HexagonMCInstrInfo::bundleInstructions(), llvm::HexagonMCInstrInfo::bundleSize(), llvm::MCOperand::getInst(), llvm::MCInst::getOperand(), HEXAGON_PACKET_SIZE, I, llvm::HexagonMCInstrInfo::isBundle(), llvm::HexagonMCInstrInfo::isDuplex(), llvm::HexagonMCInstrInfo::isImmext(), llvm::HexagonMCInstrInfo::isInnerLoop(), llvm::HexagonMCInstrInfo::isOuterLoop(), and printInstruction(). Referenced by HexagonInstPrinter(), and printInst(). Definition at line 62 of file HexagonInstPrinter.cpp. References llvm::MCInstPrinter::formatImm(), llvm::MCOperand::getExpr(), llvm::HexagonMCInstrInfo::getExtendableOp(), llvm::MCInst::getOperand(), llvm::MCOperand::getReg(), getRegisterName(), llvm::HexagonMCInstrInfo::isConstExtended(), llvm::MCOperand::isExpr(), llvm::MCOperand::isReg(), and llvm_unreachable. Definition at line 30 of file HexagonInstPrinter.cpp.